Huge Savings Item! 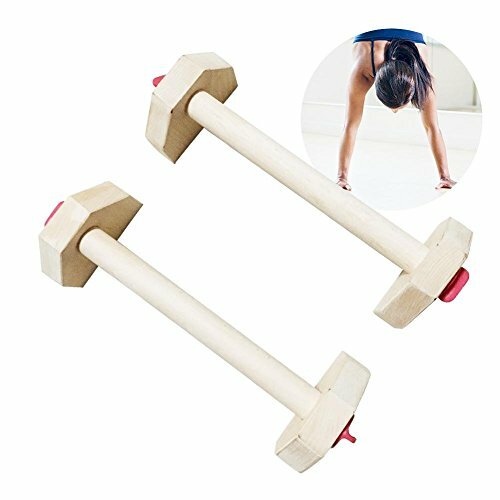 Save 12% on the Heilsa Russian Style Wooden PushUp Stands, Women Men Portable Strength Training Equipment For Upper Body Push Ups Workout, Muscle & Strength Training by Heilsa at Workout Schedule. Hurry! Limited time offer. Offer valid only while supplies last. Material: beech + plastic， moisture-proof, non-slip and cushioning. Feature: Strong, durable, moth proof and rugged for fitness. Knob lock, adjustable tension. Double bars: The wrists can be placed straight to increase the force distance, and the short shelf can reduce force. Multi-function: Suitable for body tension, balance and power with push ups, l-sit, handstand and more exercises. Size: about 40 CM/15.75 inch long, 14 CM/5.5 inch wide, 11 CM/4.33 inch high. If you have any questions about this product by Heilsa, contact us by completing and submitting the form below. If you are looking for a specif part number, please include it with your message.